KIDS FIRST! Radio » Blog Archive » KIDS FIRST! at the University of Hawaii. KIDS FIRST! at the University of Hawaii. As always, Ann Brandman, Executive Director of the KIDS FIRST! 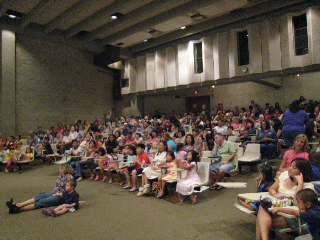 Film Festival at the University of Hawaii at Manoa, Outreach College presented a fun-filled summer of films for kids this summer. Over 1,000 kids and adults attended the Sunday series of screenings, that included Barbie in a Mermaid Tale, Plastic Perils of the Pacfiic, Duck on a Bike, Wow! Wow! Wubbzy: Wubbzy Goes for the Green and Do Unto Otters. El Salon Mexico and Alex and the Ghosts made their Hawaiian debut, as did Alba and Grandfather’s Journey. This was the fourth summer that Brandman has presented the free film series at the University. The program is supported by KIDS FIRST! and the University of Hawaii at Manoa. This entry was posted on Tuesday, August 3rd, 2010 at 4:08 pm and is filed under Film Festivals, In the News. You can follow any responses to this entry through the RSS 2.0 feed. You can leave a response, or trackback from your own site.